Missy has been smiling now since my birthday – the 28th of November. It took awhile before I could catch some smiles for the camera. They aren’t great pictures, some are even a bit blurry, I was just too excited! But aren’t they precious? Missy made me smile this morning – she slept through the night! 9:00pm-5:30am. Chook did pretty well also with 9:30pm-4:00am. It’s a shame that I stayed up all night trying to put together a video for their christening on the weekend! Talk about a wasted opportunity! 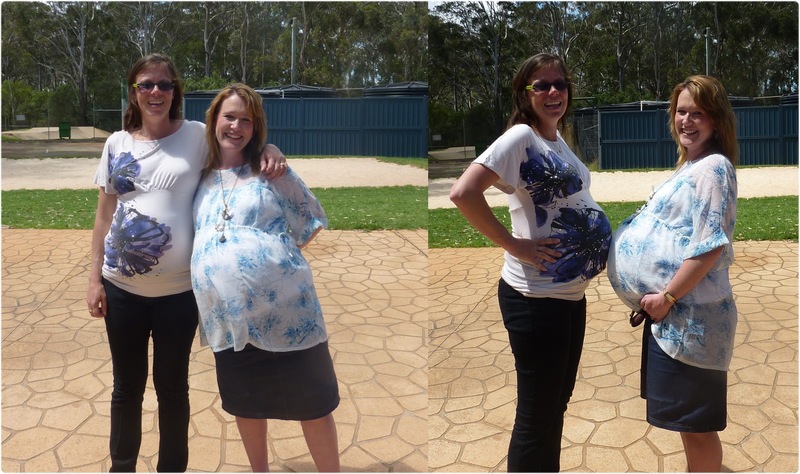 The triplets are 10 weeks today! Hooray! Today I’m linking up with Rhonda at Down to Earth for “On My Mind”. Do you have photos of your babies first smiles? (I’m still trying to get Chook and Joey to smile long enough for me to race and get the camera!) How long did it take before you had your baby sleeping through the night? THE newest additions to the rapidly growing family T are living proof that the best things come in threes. 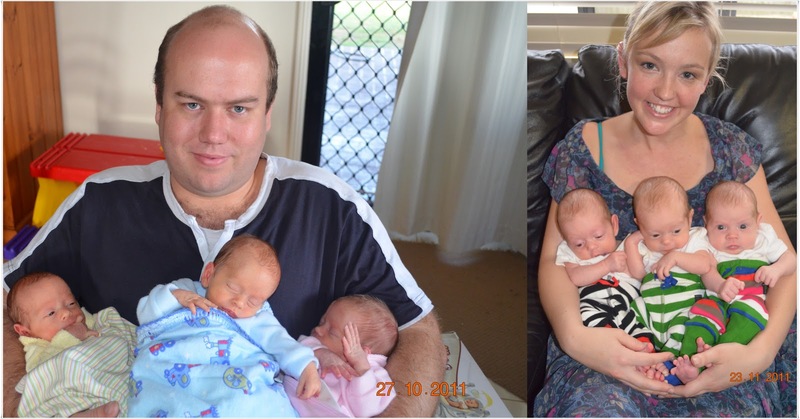 Caitlin and Alex brought home triplets Tuesday after a complication-free birth at St Vincent’s Hospital. The recent arrivals have boosted the family T to five kids, including their first daughter. “We were kind of hoping for a girl, but would have been happy with five boys,” Mrs T said. The babies were delivered three weeks ago by St Vincent’s Hospital’s new paediatrician Dr N.
Despite arriving six weeks early, the triplets were in perfect health, each weighing just over two kilograms. “I’ve never delivered triplets before – lots of twins and lots of premature babies, but this was a first for me,” Dr N said. 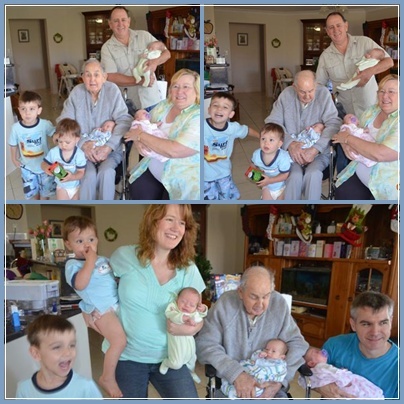 Doting grandfather was rounding up the triplets’ energetic older brothers 2 and 5. “My wife and I will be doing a lot of babysitting over the next few years,” he said. Mr Y said it was a shock when his band of grandkids suddenly jumped from seven to 10 members. “My wife and I are as tickled pink as they come,” he said. Mrs T said the staff at St Vincent’s Hospital had helped her through every step of the process. “Dr N has been fantastic,” she said. I was rather mortified at being quoted for the final comment. I mean it’s true, but I didn’t want to sound like she was a good dr just because she’s a Mum, it’s rather condescending. Anyway despite the fact that it was obvious I was back peddaling as I said it, it was published! Dr G. (when he returned home from his overseas jaunt. Still wish he’d been around for the triplet’s birth!) had a chuckle that a paed was given credit for ‘delivering’ the baby. This is the photo that was on the front page of the paper directing readers to the article on page 3. And here are some other images that were taken on the day.